From December 3rd to January 8th come to Città della Scienza to join and live with us Christmas activities. Sunday December 11th are all invited to the big party of Waiting for Christmas! A big party for families: elves and fairies will welcome adults and children showing a magic place to live together a special Christmas time. Christmas music, the magic of soap bubbles, and jugglers to make your Christmas a magic one. 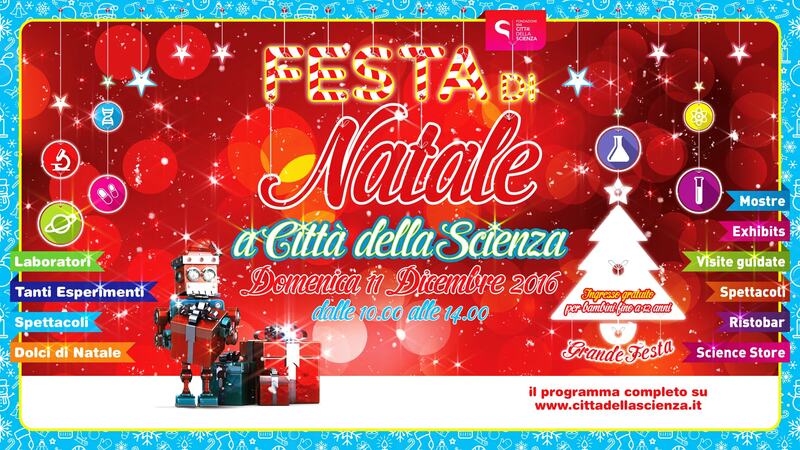 Science, technology, art, games, shows and tastings for Christmas at Città della Scienza! Find out how a plant cell is made, studying the phenomenon of the water rise in plants, learning about the age of a tree, observingphotosynthesis using oxygen and carbon dioxide sensors. Electric circuits with plasticine, LEDs, and batteries. A pic from Città della Scienza.